The ghouls of mythology are corpse-eating undead that have the ability to shapeshift, and have an affinity with hyenas. They are otherwise not very well defined, so I like to think of them as the creatures described by Brian McNaughton in his short story collection Throne of Bones. The ghouls in these stories contain elements of the ghouls of H.P. Lovecraft, and those of mythology. For miniatures, I think the old Grenadier ghouls from their Call of Cthulhu line work just fine. The first ghoul is from the Grenadier Creatures boxed set (6502). The next three are Grenadier Fantasy Nightmares Crypt Creatures (G00611) At least two of the ghouls appear in the Grenadier Ghouls blister pack (209) for Call of Cthulhu, but according to the Grenadier catalog, the female ghoul is replaced by a corpse in a coffin in the CoC blister. The next three ghouls are from EM-4. These ghouls were formerly from the Metal Magic Call of Cthulhu line. They are very similar to the Grenadier ghouls, though not as nicely sculpted. 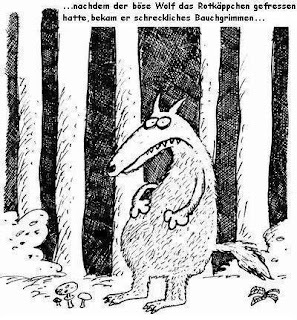 The heads are broader, longer, flatter, and have the look of cartoon wolves. The general perception of the hobbit (or halfling), is that they are small and rotund. A minority of people see them as merely small, without the rotundity. The first five halflings in the line-up are from Chariot Miniatures (HBT02). The set contained 8 random halflings armed with swords. The catalog description says that some have helmets, but I did not receive any examples wearing helmets. The last halflings in this group is the single pose from the Tin Soldier Halfling set (DFA3). 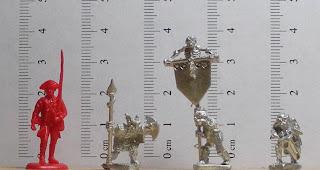 The next batch of halflings are also from Chariot. They are from the halflings with farm weapons set (HBT06). Each pose in the set was unique, but from the looks of it, all of the Chariot halflings are based on two basic body types. The final group of halfings are a mix of 15mm and 10mm miniatures. The first figure is from SLM, and is a Halfling Warder Captain (HALF01). The SLM halflings are small and slender, and go better with 10mm halflings than 15mm halflings IMO. 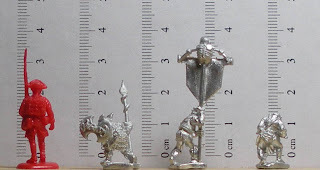 The next four halflings come from Copplestone Castings 10mm Fantasy line. These figures are from the Heroes and Halflings set (TM10). They are fantastic miniatures, modeled after the hobbits of the Company of the Ring. The last three figures are from Irregular. I'm not sure what I was thinking when I bought them, given that it didn't even cross my mind to buy their 15mm halflings. Anyway, the figures are: Halfling archer (TFAN39), Halfling with hand weapons (TFAN38), and Halfling personality (TFAN40). A comparison of the different halfings. Tin Soldier and Chariot halflings match up well, while Copplestone halflings can be used as halfling children. SLM is better suited for 10mm, and the less said about Irregular, the better.